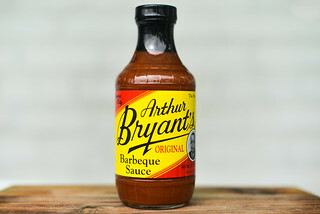 This sauce delivers on its sweet and smoky promise while going even deeper with a nice tang, mustard-y bite, and slight heat that puts it a step above the standard bearer supermarket sauce. Last summer Heinz sent me a sampling of their five new barbecue variations. Since I like to spread out my sauce reviews of the same brand, the couple times I previously received a line-up so deep, the sauces went out of production before I even finished reviewing them. Luckily, I'm approaching the finish line with the Heinz sauces and I saw them continuing to grace the shelves of my local supermarket this past weekend. 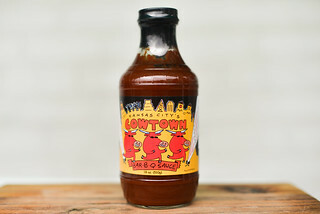 That means you can definitely still pick up this Sweet and Smoky Kansas City style sauce that was developed in partnership with Joe and Mike Pearce, the brothers the behind the Squeal Like a Pig barbecue team. Joe and Mike formed the team in 2013 as an outlet to accelerate and promote their combined cooking skills, and it only took a year until they transformed their competition craft into a restaurant called S.L.A.P. 's BBQ, which is located in Kansas City, Kansas, just west of the state line with Missouri. A more than healthy portion of smoke greats you on fist whiff of this sauce. That dominant smoky character is backed up by a strong molasses sweetness that makes good on "Sweet & Smoky" description on the label. There's also a medium tartness, which makes the tomato base veer more acidic, creating a tomato-paste like aroma. There's an additional pungent trait that smells like the vinegary bite of yellow mustard. This dark maroon sauce has a smooth consistency and glossy sheen. While it is opaque, you can still make out a few specs of black and white spices throughout. It has a thick consistancy and falls off a suspended spoon first in one large glob, followed by just one to two more slow drips. At this point, the sauce ceases releasing from silverware and leaves a thick coating of sauce still clinging to it. The syrupy consistancy of this sauce thoroughly clings to and coats the tongue. 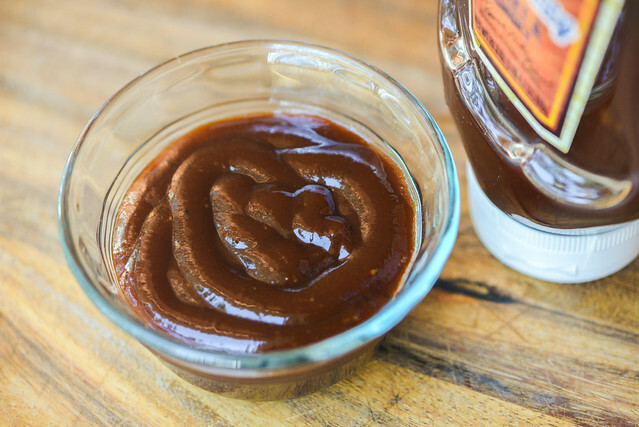 The initial flavor is a corn syrup-like sweetness, but very quickly it gains a molasses depth with a sugary ketchup base. A medium smokiness hits next, which sticks around until the ends and gains strength the longer the sauce sits on the tongue. The smoke is followed by a double dose of pungency from vinegar and mustard, while a background onion-y component makes a fleeting appearance. As the sauce leaves the tongue, the tartness and smokiness both amp up and a mild heat comes through, combining to leave a faint tingle on the tongue that mingles with the still present, but less prominent, sweet tomato. The sauce coated the chicken in a thick, uneven layer that baked down somewhat, but never completely. This led to a bit of burn off over direct heat, while the sauce that remained picked up good caramelization. The leg ended up having a nice robust, sweet profile. The more intense vinegar and smoke from out of the jar mellowed, leaving a full bodied deep molasses sugar-y flavor. Those extra-caramelized bits were especially delicious, having a concentrated flavor and a bit of crunch and chew that made the chicken all the more interesting. 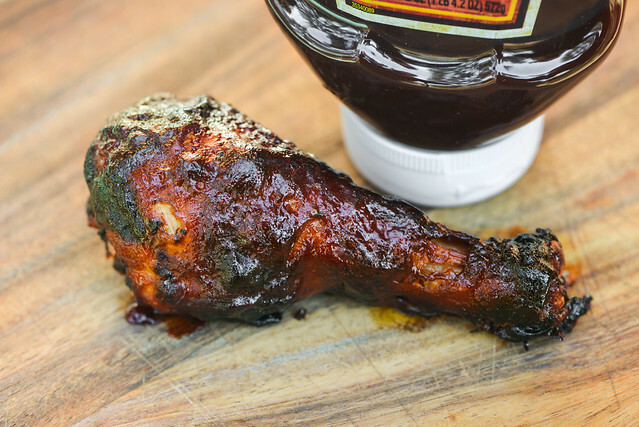 Your standard off the self supermarket sauce tends to offer "bold" and "robust" barbecue flavor, and that's where this Heinz Kansas City BBQ Sauce fits in. It certainly delivers on its sweet and smoky promise, while it also brings in a hefty hit of vinegar tartness, mustard pungency, and slight heat to round out the experience. 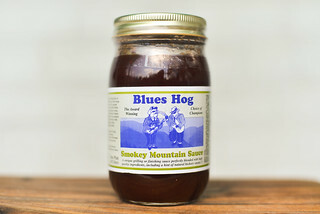 This very heavy flavor profile puts it at a notch above some similar sauces, which tend to clock in around the middle of road or just below on the overall scale of barbecue sauce quality. Ultimately these sauces are both flavored to a fault—they can be overpowering—and have an overly processed taste. That being said, when cooked, this sauce had a pleasing deep, sweet flavor that made the fact that it drowned out the chicken not all that bad. 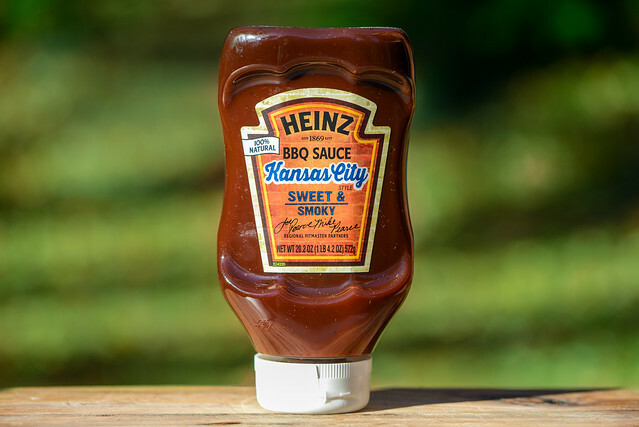 So if you're looking for the type of sweet, bold sauce that is synonymous with many supermarket staples, Heinz Kansas City will serve you well, especially when used on more substantial meats like beef or pork ribs.